NTS Communications offers $5,000 in Tuition Scholarships! The NTS Scholarship Program is available to persons completing their high school education who desire to further their education so that they can acquire the knowledge and skills to better prepare for the future. The intent of the program is to encourage individuals to demonstrate civic responsibility and scholastic achievement. Up to five (5) $2,000.00 scholarships will be awarded by the NTS Scholarship Program Committee. The scholarship will be made available shortly after the first semester begins once the committee receives a Verification of Enrollment letter from the Student Financial Aid and/or Scholarship Office of the institution that the recipient will be attending. No money will be paid directly to the recipient. A check will be mailed to the institution’s Scholarship Office. The recipient must be a person completing their high school education whose address at which they legally reside (by self, parent or legal guardian) must be within one of the following cities in the State of Texas: Abernathy, Brownfield, Burkburnett, Colorado City, Hale Center, Idalou, Iowa Park, Lamesa, Levelland, Littlefield, Meadow, Morton, New Deal, O’Donnell, Olton, Pampa, Ropesville, Slaton, Smyer, Tahoka, Whitharral and Wilson. High School seniors and nontraditional students can apply. Non-traditional students include those students attending private, parochial, home school or have obtained their GED. The application must be received by Friday, March 1, 2019. Scholarship information and applications will be available from your high school counselor, from the NTS Communications business office in Lubbock or by visiting www.ntscom.com/scholarship. If you have any questions, please contact Daniel Wheeler at 806-788-2915. Winners will be notified by early May of 2019 and invited to attend the NTS Scholarship Program Award Ceremony held that month where they will be introduced and receive a certificate. 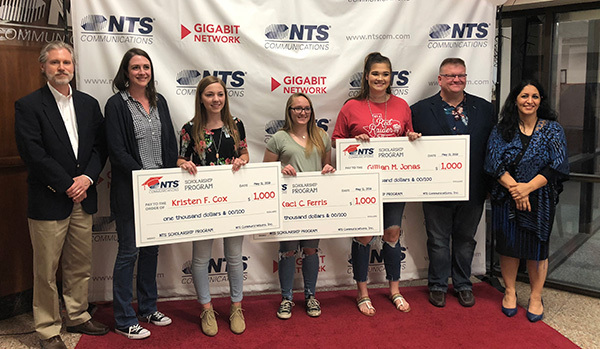 The winners of the 2018 NTS Scholarship Program are Gillian Jonas from O’Donnell High School, Jentry Wall from Ropesville High School, Kaci Ferris from Colorado City High School, Kristen Cox from Brownfield High School and Madelim Jaquez from Morton High School. Click here to view the press release.